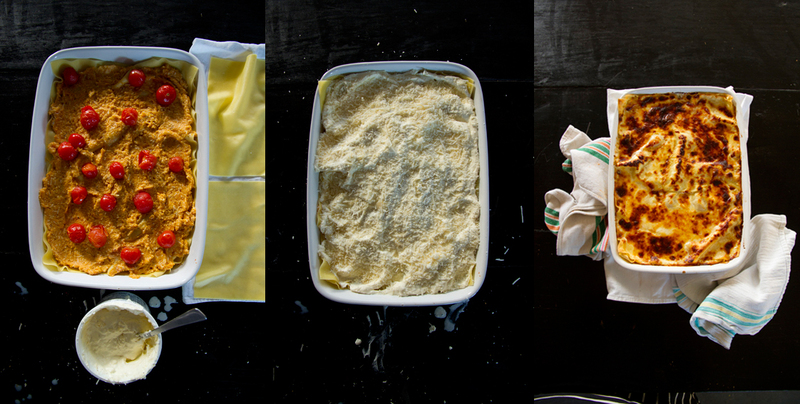 Butternut Squash Lasagne with Ricotta, Amaretti and Sage Butter – Sunday Dinner at mine. 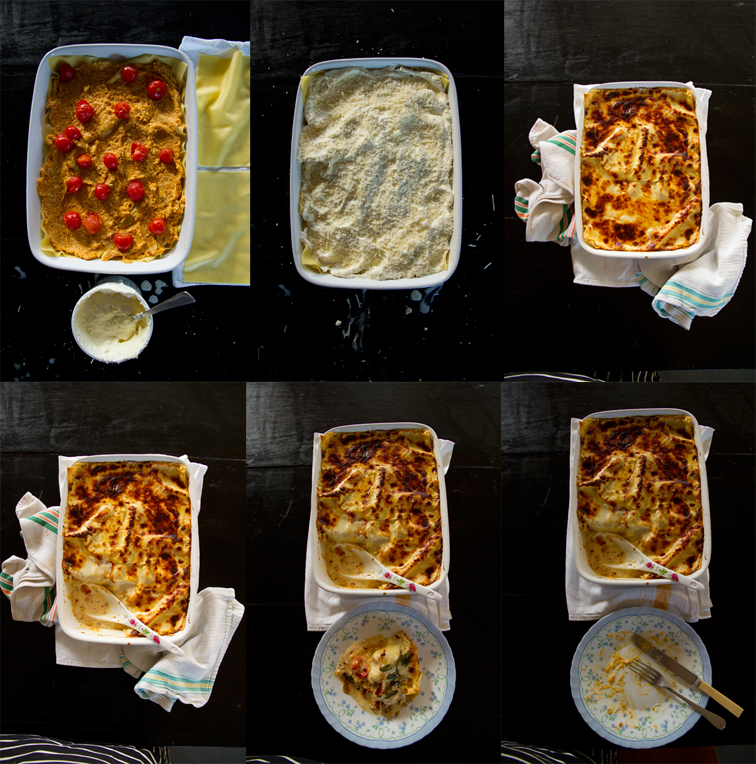 Pure comfort food, this is a very easy recipe for a very creamy and rich lasagne. The unusual addition of amaretti biscuits crumbled through it, adds a light, almondy level of flavour……Really?! Amaretti in a savoury dish? 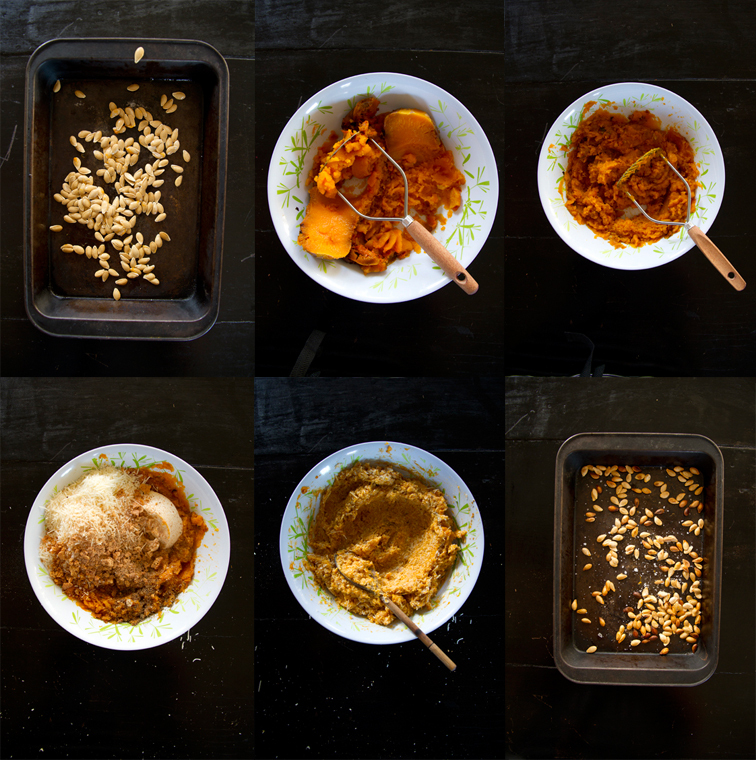 Yep, Amaretti as a ravioli filling with pumpkin is an Italian classic. Bake a whole squash in the oven? !……..What, I don’t need to peel, and deseed it first? !….No you don’t…….Whack it in the oven, bake until tender, slip off the skin and scoop out the seeds. Bosh! Fresh pasta is available in the big supermarkets. Use dried if you like but I like the fresh as it’s quick to cook and tends to be thinner and has a silkier texture. If you fancy making your own pasta, then even better…..But you don’t need to. 1. Pre-heat oven 200 C/180 fan/Gas 6. Place the whole squash on a baking tray and roast for 25-40 minutes, until when you poke it with a skewer, it is tender all the way through. Add the cherry tomatoes to the tray 10 minutes towards the end. Once the squash and tomatoes are tender, remove from the oven, set aside to cool. Little note…..You can eat the seeds of butternut squash. (as with pumpkin) Scoop out the seeds and pull away any of the stringy pulp that surrounds them. Tip them into a sieve and wash under running water and rub away any stringy pulp. Tip onto a clean tea towel and dry. Scatter onto a baking tray and pop in a moderate oven for about 10 minutes or until lightly golden and crisp. Sprinkle with a little salt and set aside as a little snack. 2. Once the squash is cool enough to handle, scrape off the skin, cut it in half and scoop out the seeds, (see little note at end) then mash the flesh in a large bowl. 3. Crumble the amaretti, (if using) over the mashed pumpkin, then add 200 g of the grated Parmesan, the ricotta and season with salt, pepper and nutmeg. 4. Bring a large pan of salted water to a boil and add the lasagne sheets one after each other into the water. Bring back to a boil and cook for 3 – 5 minutes for fresh pasta or 7-8 Minutes if using dried, or until just cooked. Drain in a large colander, shaking off any excess, and lay on clean tea towels in a single layer. 5. Spread a layer of the squash mixture in the bottom of an ovenproof dish. Scatter with a few of the roasted tomatoes and cover with a few sheets of lasagne. Repeat with the remaining ingredients, finishing with a layer of pasta. 6. Beat the mascarpone in a bowl and gradually beat in the milk. Season with salt and pepper and stir in half of the remaining grated Parmesan. Spread this mixture over the top of the lasagne, sprinkle with the remaining Parmesan and bake for 20-25 minutes, until hot and bubbling. 7. While the lasagne is cooking, remove the sage leaves from any tough stalk. Heat the oil or melt the butter in a large frying pan over a moderate heat and add the sage leaves. (they will spit and bubble oil at you so be careful) Scoop out onto a plate with any of the resulting butter or oil and set aside. All you’d need with this is a few dressed salad leaves alongside, and the crispy sage (with any of it’s lovely flavoured butter or oil) sprinkled over the lasagne to serve. 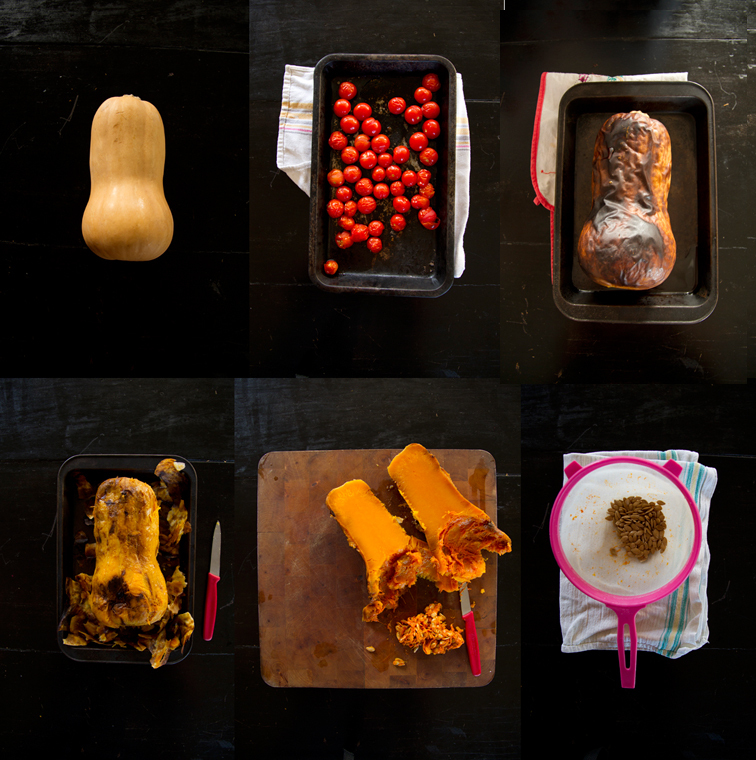 Another little note…..The skin of the butternut squash is very thin and you can eat it, once it’s cooked. So you can of course leave it on here, but I prefer to remove it for this recipe as I don’t like the texture of any flakey little pieces of skin in the mixture. This entry was posted in December, Eggs & Dairy, November, October, September, Vegetables, Vegetarian. Bookmark the permalink.